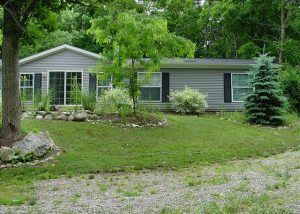 A Place at the Bay is a charming, secluded cabin in southern Put-in-Bay. This is the place to stay for your large group of 12 if you want to have all of the comforts of home, away from the hustle and bustle of downtown. This wooded property is home to one of our newer cabins. You’ll love this clean, quiet spot! Make a reservation now, because this is a very popular rental spot! A Place at the Bay is a four-bedroom, two-bath home, with a large combination dining and living room big enough for your entire party. It also has a full kitchen, so you can cook anything you’d like. There’s also a grill outside for that fresh catch from Lake Erie! There’s a wonderful picnic table on the patio outside to enjoy the meals in the sunshine. You are detached from the craziness of downtown at A Place at the Bay, but if you want to enjoy some of Put-in-Bay’s famous party atmosphere, you’re only a short $3 cab ride with Island Club Taxi away. The taxis are running all weekend, and are never more than a few minutes away. They can also take you anywhere else on the island like the many parks and green spaces on the island. If you’d like to play 9 at Saunders Golf Course, you won’t even need a taxi, you can get there on foot. The course borders the A Place at the Bay property. After your round of golf, you’ll also be right by Joe’s Restaurant and Bar. They are called the “best dive bar on the planet!” Stop in and see if you agree! A Place at the Bay is the perfect spot to get the best of both worlds at Put-in-Bay. The solitude of a personal cabin rental, the cleanliness of a new home, and the ease of transportation to Put-in-Bay’s famous downtown area. Call (216) 898-9951 or visit the A Place at the Bay page on the Island Club Rentals website to book today!